Randy and Laura Eichar invite you to visit them at their Vacuum World showroom on Lexington-Springmill Road, just south of Park Avenue West in Mansfield. With over 35 years of sales and service experience they are Richland County's leading vacuum dealer. They'll help you make an informed decision from their extensive line of vacuums. You will find commercial quality built vacuums for your home or business that are not only designed to last longer, but they help your carpet last longer. Replacing carpet is one of the single largest investments you make in your home. If the inability of a vacuum to remove deep down dirt means you will have to replace your carpet more often, shouldn't you buy the best vacuum your home deserves? 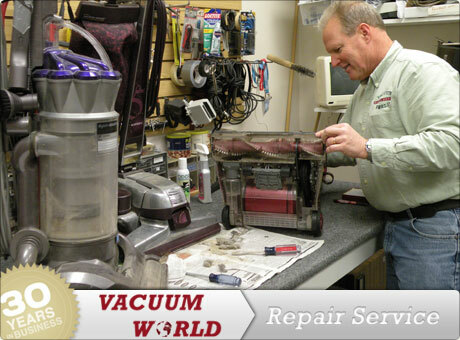 Vacuum World offers repair service, second to none. We'll service your vacuum on-site, usually in 24 hours or less and often we'll do the repairs while you wait or do your Ontario area shopping! We know almost all makes of vacuums because we've been servicing them for over 30 years.